Must Thank or Will Bust! C's preschool class sang for the parents before their Thanksgiving Feast. She loved being on stage next to her dear buddy "Roo" of course! They are like peas and carrots. What would a Thanksgiving Feast be without a few feathers on your head?! While his big sis chowed down, J scoped the ladies while leisurely enjoying his animal crackers. We celebrated at Mom's the Sunday before Thanksgiving. Here J was darting from Aunt Mimi's friend, showing him who's boss and all. or was it whipped cream and pumpkin pie? "See Caroline. He likes carrots. You should too!" We had to make yet another hat with feathers. Maybe I have turkey envy? OK, this is where Thanksgiving gets hard. We always take a family photo before we destroy Mom's beautifully decorated table. "Put a fork in it, and let's eat!" We stayed in our Pj's all morning and watched the Macy's Day parade, while sweet Daddy watched the brush all morning for a gobbler with Grandpa and froze his 'tookus' off as is the family tradition. I then studied, and I mean studied the Black Friday ads like it was life or death. Quick! Ask me where you can find the cheapest, yet most fashionably acceptable men's jeans. I think if I happen to wake up at 4 a.m. I will buy my darling a pair. Then off to the Fields' Thanksgiving where sadly the turkey came from Kroger yet again. Caroline did manage to capture a few hugs from this tender bird though! Most of the evening was spent on the floor having so much fun! Caroline had her chocolate milk in a special, very fancy, very big-girl glass which made her night! And to conclude the mad dash through our Thanksgiving festivities, the cousins crossed the finish line with big bellies and happy hearts! Today is my dad's 63rd birthday! Hard to imagine my dad with gray hair and an older man's pot belly. When my dad passed away unexpectedly 11 years ago I remember in the midst of shock and deep grief how sure and certain I was to have been blessed to be his daughter. I knew even then that I would have rather had a shorter amount of time with him than a longer amount with an average father. He was such an adventurer: pilot, avid sailor, hiker, camper, he would spend entire days bicycling around the D.C. area, always exploring or tinkering. Growing up with him had no shortage of trying new things that enriched us all. What a gift to have had a father who did not feel limited in life, although he faced major health issues from his 20s onward. He was a humble, honest person known for his integrity. His quick laugh was often coupled with a crooked smile that I'm certain endeared him to all of his childhood teachers. My dad was the kind of father who took a day off of work, travelled hours, and helped clean the house my college roommates left me with at the end of a lease. The smell of a pipe, trumpet solos, peanuts, and all of the D.C. sports teams remind me of him. He was a California boy who grew up playing cowboys and grew into an investigator protecting the innocent for the U.S. Office of Special Counsel. As a Naval officer he settled on the east coast, but could never quench his thirst for "real" mountains and lakes. He had a gifted intellect and loved long conversations especially good debates. I remember when he passed wondering, "Now who's going to keep me informed?" My dad really challenged me in my thinking and understanding of my beliefs. He was a natural philosopher and seeker, and to tell you the truth, I'm not sure exactly what he believed. However, our discussions are still a gift encouraging me to mature in my faith with not just my heart but also my head. I am thankful that the spiritual truth of a loving Creator or heavenly Father is not an unreasonable thought because of my dad's devotion and love for his girls. Now over a decade later I no longer feel my "loss echo inside of myself" which I shared at his memorial service. I can see clearly the amazing man he was and God's fingerprints all over our lives. He would have been such a fun granddad, but I know his legacy will stir the imaginations of our children in a special way. Certainly to honor my dad and thank the Lord for him on his birthday is a privilege I treasure. Alas, my love-hate relationship with my blog continues. I love it when I am on a roll and I feel as though I have successfully documented every cute photo and monumental moment in our lives, but am so frustrated when compelled to catch up on the past two months! It reminds me of all those stray diaries and scrapbooks I come across occasionally with only 3 entries. However, I am returning to Blog Land once again and before the holidays! Here is a quick jaunt through my favorite October memories. Erin and Kenny came to visit! They moved to San Diego close to 5 years ago, and can't you tell?! Look at those boots, my friends! No one is near hip enough to get away with those in our little town! 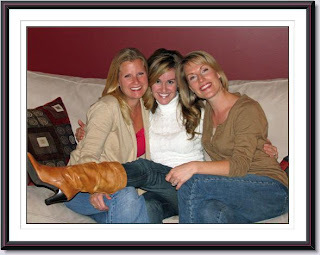 Erin, Kim, and I taught together at Central and became fast friends. These two are precious to me! We were having so much fun catching up that I could have camped out for a week. Mom had an amazing bon fire on the 18th to celebrate the season. Her boyfriend Jimmy brought his crew, so we got to meet "the family" for the first time which went really well. We were also able to hang out with Laurie, a dear family friend, who is nothing but fun. So in short lots of food, good music, goofing around, and again lots of marshmallows! On the 22nd we went to a local jogging trail and picnicked with Grammy. What a great way to spend the afternoon! And yes my friends, this is yours truly "jogging" on the trail. And this is my little miss helping her momma finish the course. FUBC had their annual Fall Festival which is always so much fun. We have an amazing puppet ministry that C absolutely loves. It's all about Joey the Puppet! One of the best parts of this afternoon was the cake walk. Little Miss walked away with a plate full of chocolate Rice Krispy treats. It was neat to watch elderly people using walkers along side daddies holding little people learning to walk all gallivanting around the cake walk. Nothing like sugar to unite the generations! I was chatting on the phone and wondered why J was suspiciously quiet. I walked into his room and this is what I found! As if an alien had politely set him up for a portrait. Little Dude was quite content and very proud of himself, although check out his look: "Busted. FYI when you marry a southern boy breakfast is no longer about eggs Benedict and French toast. It becomes all about the biscuit. A good morning (some may even argue any good "meal") will have biscuits, but a great morning of course includes the gravy. So true is this tidbit that my sweet hubby made himself this delicacy one morning before work! (Was he gearing up for a good or bad day, I don't know.) That morning I figured I could no longer keep my children from certain evils in the world so I inducted them into the life of being biscuits & gravy connoisseurs. Below reflects C's point of view on the tasty vitals. The next photo says a 1000 words. Looks like there is a biscuit and gravy gene! J even went so far as to dip the biscuit in the gray matter, not to eat it but instead to lick the gravy off of his fingers. My very own Raggedy Ann and Andy!